The easiest way to ensure a child's safety on the water is to make sure they wear a life jacket that fits. But children's growth spurts and last minute changes to the roster of invited guests do not always make that easy. However, your marina or local waterfront business can help if they partner with the BoatUS Foundation for Boating Safety and Clean Water's Life Jacket Loaner Program for kids.Since the program began in 1997, at least three children's lives have been saved by wearing a BoatUS Foundation loaner life jacket, and each year over 90,000 life jackets are borrowed - at no cost - for a day or weekend from the over 500 loaner sites nationwide. There is no cost to host a loaner site, but applications will only be accepted until March 11th, 2011. Each location that is accepted into the program will receive a life jacket loaner kit, a protective container that holds various sized life jackets for kids up to 90 pounds, signage, promotional materials and easy-to-use sign-out sheets to track usage. "The BoatUS Foundation Life Jacket Loaner Program is the largest and longest running nationwide loaner program." said Program Manager Alanna Keating. 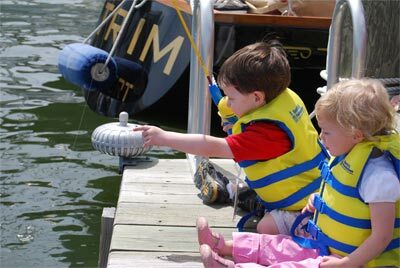 "We make our program simple for those hosting a location as well as for boaters, anglers and sailors needing a kid's life jacket. We provide all of the materials needed for the program and all we ask for in return is that the life jackets are available for free to the boating public in a readily accessible but secure location, and hosts periodically let us how the program is going," added Keating. To apply to become a Life Jacket Loaner Program site, or for more information on the program or the life jacket laws in your state, please visit www.BoatUS.com/Foundation/LJLP.